By architect Aleksandr Makukha, 1970s. Dushanbe, Tajikistan. Photo: Stefano Perego. The first film shootings on the territory of modern Tajikistan were carried out by visiting cinematographers, amateur photographers and travelers during the first decades of 20th century and were mostly ethnographic by nature. 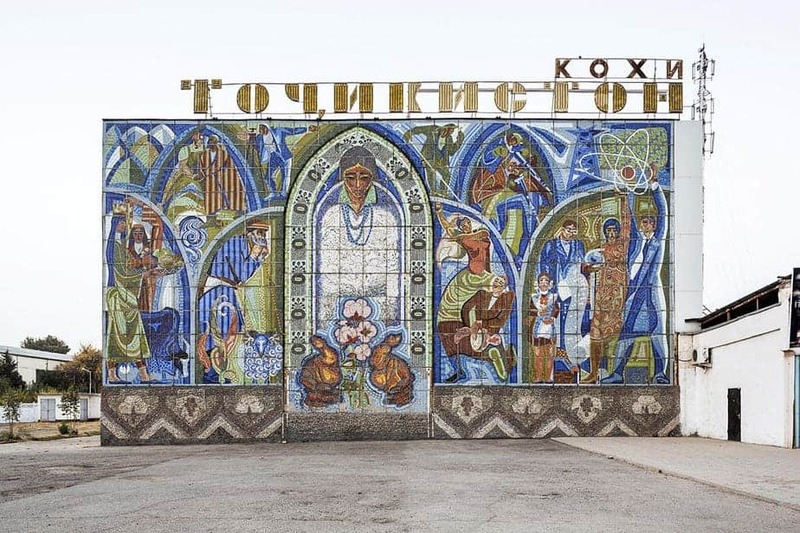 Similar to other former Soviet republics, the development of the cinema in Tajikistan was associated with the State Tajikfilm Studio from its foundation up to 1990s. The Tajikfilm studio was founded on the premises of a small film-processing lab that initially produced newsreels assembled monthly under the title Soviet Tajikistan. The founders of this lab—Artem Shevich, Nikolay Gezulin and Vasiliy Kuzin—would go down in history as the pioneers of Tajik cinema when their memorable footage of the arrival of the first train in Dushanbe (1929) was exhibited during the proclamation of the Tajik SSR on 16 October 1929. The following year, the Soviet Government subsidized the renovation of the lab and established Tajikkino, a trust to oversee film production and distribution. In 1931, Tajikkino was split into a film production studio and a distribution company, though the studio continued to be known as Tajikkino until it was renamed Stalinabad Film Studio at the end of ‘30s, and Tajikfilm in 50’s. Feature film production at Tajikfilm commenced in 1932, with the feature film When Emirs Die (1932) by the pioneer woman-filmmaker Lidiya Pechorina and the short film The Honorable Right (1932) by the first national film director and film actor Kamil Iarmatov. Inspired by the montage theory of L. Kuleshov and S. Eisenstein, director Kamil’ Iarmatov’s career took flight at Tajikfilm with his second silent film Emigrant (1935), securing a place in history as one of the founding fathers of Tajik and Uzbek cinema. The following year, it was Lev Kuleshov himself who made Tajikfilm’s first sound film Dokhunda (1936) based on a novel by Tajik writer Sadriddin Aini. But to our regret, this film is considered to be lost. During the Great Patriotic War, as Soviet film studios evacuated to Central Asia, Tajikfilm was briefly merged with Soyuzdetfilm studio, the Moscow based production company of children and youngster’s films. The period from 1941 to 1943 resulted in films such as The New Adventures of the Brave Soldier Shweik; Timur’s Oath; Tajik Concert for the Front; Son of Tajikistan jointly produced at the studio in Stalinabad (former name of Dushanbe). Following Soyudetfilm’s return to Moscow, various economic factors brought feature film production at Tajikfilm studio to a halt, yet the production of newsreels and documentaries continued. The first international accolade received by Tajik filmmakers was the Bronze Medal at the sixth Venice Film Festival for the feature-length documentary film Tajikistan (1946). Feature film production revived after a hiatus of twelve years with Dokhunda (1956), My Friend Navruzov (1957) and I Met a Girl (1957) coinciding with the second Decade of Tajik Art and Literature in Moscow in 1957. A new wave of young filmmakers trained at the VGIK brought about a renaissance at the studio from the end of ‘50s to the ‘70s, with such renowned productions as I Met a Girl (1957), the musical comedy by Rafail Perel’shtein, Children of Pamirs (1963) by Vladimir Motil, Zumrad (1962) by Abdusalom Rakhimov and A. Davidson, Fate of the Poet (1959), the biopic directed by Boris Kimiagarov about the great Tajik poet A.Rudaki, that received the Grand-Prix of the International Film Festival of Asia and Africa in Cairo in 1960, as well as his cycle of films on Firdausi’s Shahnameh — The Flag of the Smith (1961), The Legend of Rustam, (1970), Rustam and Sukhrob (1971), and The Legend of Siavush (1976). Along with the philosophical cycle on Shahnameh, commercially successful and world acclaimed was the trilogy directed by Tokhir Sabirov (One more night of Scheherazade (1984), New tales of Scheherazade (1986), The last night of Scheherazade (1987), inspired by the ‘1001 Nights’ folktales. The cinema of the 1980s reflected a changed outlook as more and more documentary filmmakers turned to feature film production, amongst them Davlat Khudonazarov (Murmur of a Brook in Melting Snow 1982), Mairam Iusupova (The Time of Yellow Grass (1991), Saif Rakhimzod-Afardi (The stars shine above the Tanur (1991), and Safar Khakdodov (A dream in reality (1990). Meanwhile, the filmmaker Bako Sadiqov (Blessed Buhara (1991), Dzhosus (1993), The Island (1993) and The Imam al-Bukhari (1995) was already at the helm of an allegorical movement in Tajik cinema. Perestroika stimulated the emergence of independent film studios like Sinamo, Movaronnahr, Vvys’, and Haoma that almost took over the feature film production in Tajikistan in the 1990s. The disintegration of the USSR, the ensuing civil war (1992-1997) and emigration of the intelligentsia led Tajikfilm studio to a hard time. The studio, in fact, produced only official newsreels and documentaries (shot on film as well as on video) in the first years of independent Tajikistan. But it is noteworthy to mention that in late 1980’s-1990’s the documentary filmmaker’s of Tajikfilm produced films on the Tajik civilizational heritage. These films like Discovering Osrushana (1989), Hephthalites, who are you? (1993) and the first video-series Bobojon Ghafurov: phenomenon of the book ‘Tajiks’ (1998) directed by Mamatkul Arabov, questioned the reality and drew parallels to the historical and archaeological legacy of Tajik people, preserving their historical memory in documentary cinema. The first Tajik feature films produced in the new millennium include digital video productions Statue of Love (2004) by Umedsho Mirzoshirinov and Wanderer (2005) by Gulandom Muhabbatova and Daler Rahmatov. After a long break, an internationally acclaimed film True Noon (2009) directed by Nosir Saidov was shot on celluloid. This film was made on a relevant borderline issue, occurred after the disintegration of USSR, when one morning a village was divided between two countries. On December 27, 2017 the State Tajikfilm Studio and the State Unitary Tajikkino Enterprise of Film and Video Distribution were merged into the State Tajikfilm Institution under the Government of Tajikistan, becoming a landmark in the development of contemporary Tajik cinema. The new period of governmentally subsidized Tajikfilm Institution concerns itself with the further modernization of the existing technical basis, film distribution, the self-sustaining film production and the construction of the new cinema halls. Currently, Tajikfilm has its regional branches in Sughd, Khatlon, Badakhshan provinces of Tajikistan. Beside Tajikfilm productions, there are films made on the State Sugdsinamo Studio named after Kamil Iarmatov in Khujand, on the Khatlonsinamo Studio named after Bakhtiyar Khudojnazarov in city of Bokhtar. The regional Tajik cinema is represented by the films in Pamiri languages, partially or fully created in Badakhshan. If the Tajik cinema of 1990-2000’s was associated with the names of Bakhtiyar Khudojnazarov (Bratan (1991), Kosh ba Kosh (1993), Luna Papa (1999) and Jamshed Usmanov (The flight of a Bee (1998), The Angel on the right (2001), To get to Heaven, first you have to Die (2006), the two internationally acclaimed filmmakers, who shot their first films in Tajikistan, then there is presently a new generation of Tajik filmmakers who came into the scene since 2010. The film researchers of Tajik cinema in 1990-2000’s were pointing to the strong influence of Iranian cinema, which in turn was justified by the fact that Mohsen Makhmalbaf, the Iranian film director, who lived and worked in Dushanbe for about 10 years, produced the three feature films (Silence (1998), Love (2005), The Man Who Came with the Snow (2008) and contributed to the foundation of the Didor International Film Festival as well as the revival of the film culture. Like Iranian cinema, the Tajik cinema mostly tends to use realistic approach, interest in social issues, in national language, and also similarly focuses on stories about children who were the favorite topic for depiction in Iranian cinema due to censorship. However, since the 2010’s, another trend, the appearance of other cinematic styles, takes place. It is conditioned by not only the training which the filmmakers received either in Tajikistan or Iran, but in various film schools in Russia, India, USA and South Korea. Thus, the graduates of these film schools work in aesthetics, which was cultivated in a particular educational institution and cinematic tradition. The most famous Tajik feature films produced during the past five years are Teacher (2014) by Nosir Saidov, Dream of an Ape (2016) by Rumi Shoazimov, Air Safar (2015) by Daler Rakhmatov, The Break through (2016) by Umedsho Mirzoshirinov and Narrow (2018) by Muhiddin Muzaffar. The film Teacher (2014) by Nosir Saidov narrates a story of an old teacher who, anticipating his end, asks his son to dig a grave for him. This activity is considered to invite troubles in the village and that’s why it evokes villagers’ protests. The film portrays the conflict between the radical religious mentality and the mundane culture and education through the family clashes. Indeed the old teacher, who passes away at the finale, symbolizes the Soviet epoch, and the film overall warns the Tajik society about the danger of radicalisation. The film Dream of an Ape (2016) by Rumi Shoazimov became a first attempt to make a horror film in Tajik cinema. The main conflict of the film is centered on the magical amulet, the Ape’s paw, which can fulfill any three wishes but simultaneously takes away something precious in one’s life. Being an adaptation of an American novel, it is rather abstract, because the film avoids any resemblance to national Tajik culture. Being the debut film of Rumi Shoazimov, the VGIK alumni, this film is very much influenced by traditions of Russian cinema and theater. The film Air Safar (2015) by Daler Rakhmatov is one of the examples of a popular comedy in Tajikistan. The film exploits situational comedy when the two similarly looking protagonists, a Tajik farmer and a Frenchman, are mistaken for each other. Noteworthy that this film can be perceived as a contemporary fairy tale which intertwines the relevant challenges, like Taliban, and the magical Air Balloon trips inspired by Jules Verne’s novel. One of the bright examples of a feature film made in Pamiri languages is The Break through (A.k.a. Mushkilkusho, 2016) by Umedsho Mirzoshirinov. The film narrates a story of a Pamiri girl working in Russia who falls in love with a Russian boy. Similar to the ‘Romeo and Juliete’ love story, the families of the young couple can’t accept this relationship due to the ethnic prejudices. The Pamiri girl returns home after her lover dies in the car accident and she already expects a baby. Coming back home to the mountains, to her own roots and taking a blessing at the local Saint’s tombstone, symbolizes the spiritual journey a Tajik woman takes to overcome the difficulties, prejudices and give birth to a new life. The film Narrow (a.k.a. Tangno, 2018) by Muhiddin Muzaffar is an example of the Sugdsinamo, the film studio based in north of Tajikistan. It narrates the story of a small boy who is not circumcised on time because of the difficult financial situation, and who becomes an outcast in the village. The film boldly portrays the Tajik folk culture of inhabitants of Panjakent area, simultaneously manifesting the power of tradition in everyday life of Tajiks.